Not a "COOL IDEA" | THERMO Spoken Here! In sweltering summer heat, outdoor pools feel just like hot tubs. It's silly, but some pool owners try to "beat the heat" by dropping hundreds of pounds of ice into their pools. On the day of his daughter's wedding, an architect had 800 pounds of ice (1 atm, 10°F) dumped into his swimming pool which was completely full of water (1 atm, 90°F). The pool, 15 feet by 30 feet with an average depth of 4 feet, had a five-horsepower circulation pump operating. In about an hour all of the ice had melted and the water in the pool was still unpleasantly warm. The architect wondered "What went wrong?" Overflow of Water: When the crushed ice was put into the pool what mass of water overflowed onto the surrounding pool deck? The sketch shows our imaginary cube of ice in its floating position in the pool. Since the pool was initially completely full, the volume of the cube below the water surface equals the volume of water that was displaced onto the deck. Our system is the cube of ice. We use the momentum equation. The condition of the ice is that of uniform motion (with zero velocity). The sum of forces that act on the cube equals zero, 0 = ΣF. We use this fact to calculate the depth of floating, d.
Second Pool Temperature: How cold might the pool water be once the ice melts? ♦ The pool water will get cooler, but with the sun blazing, swimmers and the pool motor operating, the effect will be temporary. However, with the assumption that the ice and water are an adiabatic system (0 = ΣQ), we can calculate a second "theoretically" coldest temperature to determine if anyone who swims might catch a chill. The calculation commences with the energy equation. This process is called "thermal equilibration." Summation signs (Σ) in equations serve as reminders that more that one substance might be involved in the event and or discrete amounts of the same type of substance might have different initial properties. It is safer to write a longer form of the energy equation then reduce as needed than to reduce it in your head, once and for all. Is this case the water of the system has two initial states with different phases. We assume kinetic and potential energy changes of lowering the ice into the pool to be negligible (It is not a meteorite that enters the pool). The adiabatic assumption eliminates consideration of heat (ΣQ = 0). Finally there are two components to ΣW, which are compression work of the water event and power average power times time for the circulating motor. We see the groups, U + patmV. These are enthalpies, H.
We leave the work of the circulation pump "as is" for now. The summation of enthalpy changes includes two items. There is pool water which was initially and finally liquid and ice which was initially solid and finally liquid. Notice above that the second enthalpy of water will be less that the first. This is assured because T2 is less than 90°F. The specific heat, cliq, is listed in Table 4.1 (row 3, col 3; EE-units). The event of the ice involves energy increase with melting at constant pressure. The energy change is that of enthalpy. The energy of the second state of the water (that was originally solid) will be greater than it was initially. The second enthalpy equals the first enthalpy, plus the energy to warm it to 32°F plus the energy to melt it plus the energy to warm it above 32°F to 0 T2. The specific heat used as the ice warms to melting temperature is 0.45 btu/lbmoF (row 3, col 1; EE units). The heat of fusion, hsf is listed as 144 btu/lbmoF (row 3, col 2; EE units) We enter the masses, the appropriate specific heats, and the latent heat of fusion of water. Check to see that the above is correct, then collect. Specialized sketches are helpful to understanding. The pressure of this event is one atmosphere. With the system substances there are changes of enthalpy and one phase change. There are many such events. An enhancement of this solution is to display it on Enthalpy versus Temperature coordinates. 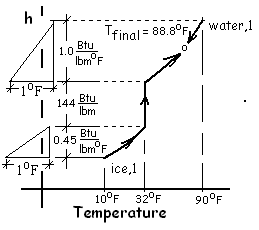 The sketch (right) shows the water and ice initially with their temperatures 90°F and 10°F respectively. When put together, the temperature (and energy) of the water diminishes slightly. The energy of the ice increases, until its temperature becomes 32°F, pauses temperature-wise while its energy changes from solid to liquid, then increases to the final, uniform temperature, 88.8°F.